This project is a 4-phase unipolar stepper motor controller. 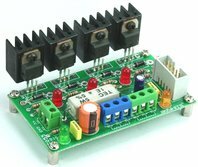 Unipolar 4-Phase Stepper Motor Controller Board will help you control a Stepper Motor or 4 individual Solenoids. This circuit consisting of transistors that serve as current amplifier and also diode to prevent damaging back EMF, circuit uses Darlington transistors to provide high current capacity to unipolar stepper motor. Just provide sequence of pulse using Micro-Controller or descript circuit to roll out the unipolar motor. On board High Watt resistor to control the current, value of the resistor can be set as per your load current requirement.